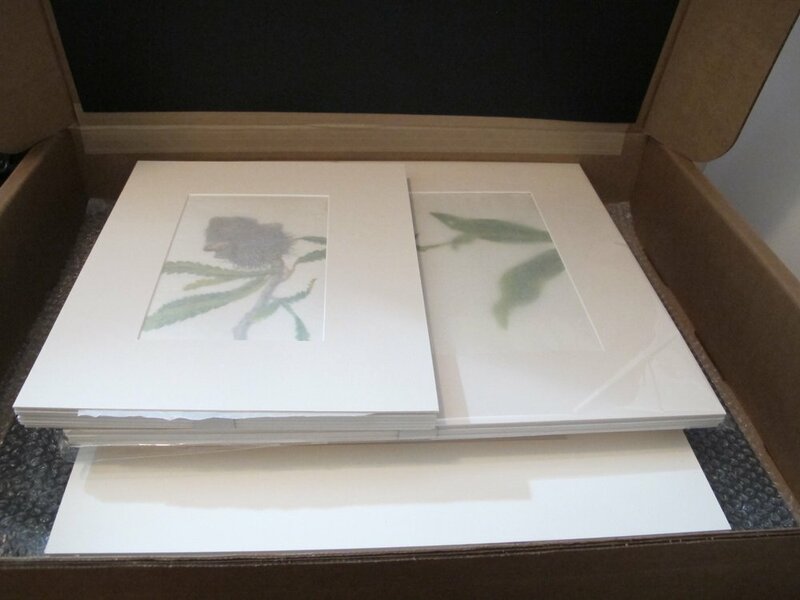 At long last, all 10 of my paintings have been shipped to the Netherlands for the exhibition Journey of Plants, opening at the Museum De Buitenplaats on September 16, and traveling after its close there in January. Stellar artist figures Anita Walsmit Sachs (an organizer of the exhibition), Beverly Allen (Australia), Helen Allen (UK), Mieko Ishikawa (Japan), Jee Yeon Koo (Korea), and Vicki Thomas (South Africa) have each created 10 works for the exhibition, which examines how plants become very familiar to us and seem to be our own, even though they have come from somewhere else. And a part of the story is about the plants that don't travel all so well. My 3 focus paintings are: Glass Gem corn, purple potatoes, and vanilla orchid. The other 7 are hops, sunflower, banksia, 2 paintings of North American pawpaw (Asimina triloba), three-birds orchid, and purple fringed orchid. I'll report from the show once it's open! Thank you to Patty Wageman, Museum Director, and all the staff at Museum De Buitenplaats! I studied this sunflower last summer at Arrowood Farms in Accord, NY. The field was filled with what seemed like a million sunflowers, but I had to choose just one! 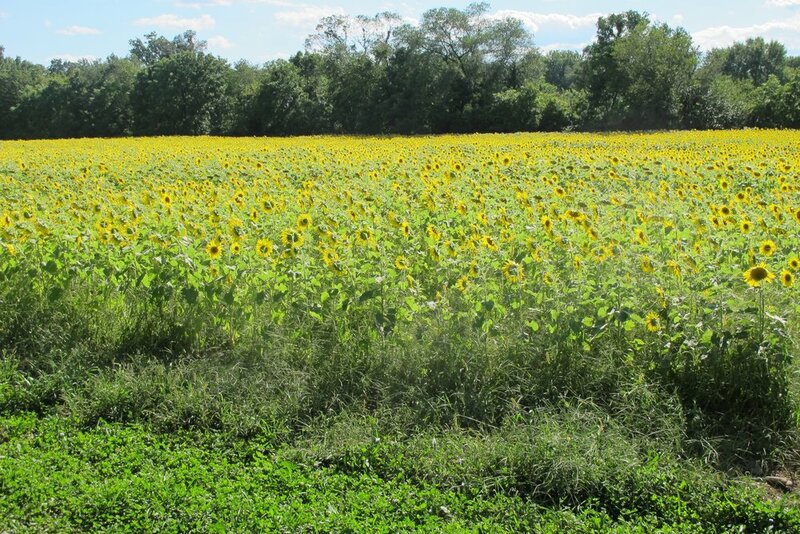 Some of the sunflowers at Arrowood Farms last year! Thank you Let, Blake, and Jake for the great subjects! The first shipment of 8 paintings being readied for shipping to the Netherlands. A couple of new exhibitions will open soon at the Shirley Sherwood Gallery, Kew, devoted to Australian and New Zealand plants. One will include selections from the Royal Botanic Gardens, Sydney's Florilegium. The second will feature artworks from Shirley Sherwood's collection, illustrating plants from New Zealand and Australia. This second show, called "Down Under II" will include my painting of Phormium tenax, which I studied at Chelsea Physic Garden several years ago. This was a huge and vigorous specimen, and with its bronze-y seed pods was a real knockout. The two exhibitions run from March 31 to September 16. See more info on Kew's website here. Work begins for the 2018 exhibition in the Netherlands "Journey of Plants"
This is the start of my Vanilla orchid painting on a piece of Rory McEwen's vellum. It was studied at the Huntington Botanical Gardens in San Marino, CA with the help of Brandon Tam. Artists included are Beverly Allen, Australia; Helen Allen, UK; Mieko Ishikawa, Japan; Jee-Yeon Koo, Korea; Vicky Thomas, South Africa, Anita Walsmit-Sachs, Netherlands, and myself, representing the Americas.